Photo courtesy of Jennifer Burns. Eggs Benedict is an important part of the traditional American breakfast and brunch. It is a careful blend of poached egg, Hollandaise sauce, ham or bacon in between two fresh slices of an English muffin. For most people in Kansas City, these ingredients are necessary to create the best, most delicious version of this popular American brunch dish. So where do you go for the best Eggs Benedict in Kansas City? The answer is simple: Kate's Kitchen and Ronnie's Restaurant. Let's take a look at this classic breakfast staple. We dare you not to drool. Why are Eggs Benedict So Good? Many Americans consider Eggs Benedict to be the best dish for breakfast or brunch. You can serve this dish and surprise your loved one on that special occasion. For most people who enjoy making breakfast, preparing the meal presents a delightful challenge. It requires careful orchestration of the various ingredients. The eggs need to be poached right, the bacon needs to be crispy and you need to keep the Hollandaise sauce unbroken simultaneously. You will also have to consider how other ingredients will affect the result when you are going for a variation of the meal. Another reason to have Eggs Benedict for breakfast is for the nutritional value of the dish. The meal is a high protein cuisine that can keep you feeling full for the better part of the day. You can reduce the amount of processed carbohydrates you consume for breakfast. The amounts of proteins and carbohydrates that are in an Eggs Benedict dish will depend on the ingredients. Eggs, which are a central part of the dish, are very nutritious. They contain some of the most important vitamins and nutrients such as Vitamin A, Vitamin B5, Vitamin B12, as well as phosphorus, selenium, and important trace elements. Eggs help to raise levels of HDL (High Density Lipoprotein) sometimes referred to as “good cholesterol”. People with sufficient levels of HDL are less prone to stroke, heart disease, and cardiovascular diseases in general. Not everyone who enjoys the dish has the time or desire to prepare Eggs Benedict. In fact, some seasoned cooks find it to be quite challenging since it is important to get every part of it right. Eating out may be the best option for people who cannot set aside time to prepare it for brunch. You can enjoy a sumptuous meal of Eggs Benedict in a family-friendly environment at Ronnie’s Restaurant and Kate’s Kitchen. There are a number of variations you’ll find at either of our locations in Lenexa and the Northland, respectively. The Corned Beef Hash Eggs Benedict will be most appreciated by those who want a little bit of texture from the corned beef, that is also blended with other ingredients like Canadian Bacon, onion, spinach, and tomatoes for the best Eggs Benedict brunch meal you can get anywhere in Kansas City. 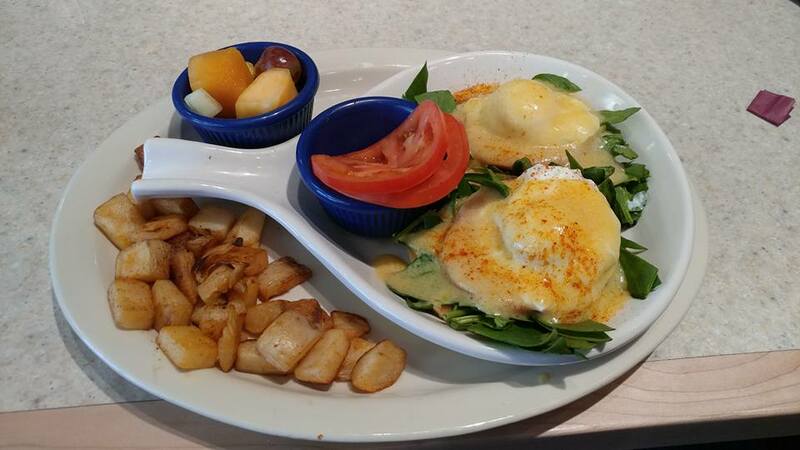 Come in to Kate's Kitchen and Ronnie's Restaurant and order the best Eggs Benedict in Kansas City! We make the hollandaise from scratch and serve it up hot, fresh, and made to order. Proudly serving the Northland and Lenexa until 2pm, seven days a week.